Pamela was a typical obedient Filipino, destined to be a licensed registered nurse. But then life took a detour and opened up to the exciting world of entertainment as a production dancer/magician’s assistant. Although she was told, ’You’re too old, too Asian, and too short’ she is catapulted into a long and fulfilling career as a dancer on a cruise line for a decade. Pamela grew up with secrets and lies. A poor little rich girl in a 3rd world country. Her father took the Najera family and immigrated to America. Then a chance for a lifetime adventure comes barging through the door. Pamela, seemingly suddenly, is performing with well renowned magicians traveling the world and making numerous appearances at the Magic Castle. Pamela then continues on as a cruise ship dancer/entertainer touring the waters from the Atlantic to the Pacific Ocean; through the Gulf of Mexico and the Caribbean Sea. Join Pamela, as she takes you through her journey of transformation despite the comical limitations she was born in to. 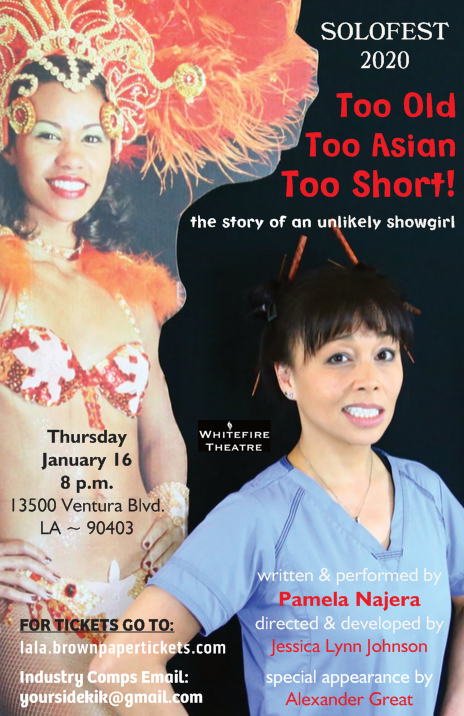 TOO OLD, TOO ASIAN, TOO SHORT at Hollywood Fringe! CORINA: FROM LAP DANCE TO SUNDANCE at Hollywood Fringe!! LA WOMEN’S THEATRE FESTIVAL 2019!